Mabuhay! Welcome to this blog dedicated in spreading news regarding related happenings concerning the restoration and promotion of orthodox and traditional Roman Catholic customs, traditions, practices, music, sacred art and liturgy in the Philippine setting. 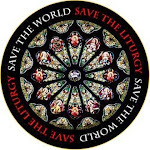 SAVE THE LITURGY SAVE THE WORLD! Catholic Educator with a Master of Arts in Theology degree from San Sebastian College-Recoletos Institute of Graduate Studies. Faculty memeber of the College of the Holy Spirit-Manila, De La Salle-College of St. Benilde and Philippine Women's University. Tridentine Mass known as "Rorate Caeli" in honor of the Blessed Virgin Mary during Advent was celebrated at the Chapel of Jaleville Subdivision in Paranaque as requested by the members of the community. The 7:30pm candlelight Mass in honor of the Ecclesia Dei Society of St. Joseph Patroness - Ntra. Sra. de la Esperanza La Macarena (Our Lady of Hope of Macarena,Feastday Dec. 18), coincided with the 22nd Foundation Anniversary of the EDSSJ. EDSSJ members again were invited as Mass servers and as Choir. Celebrant is Fr. Jojo Zerrudo, spiritual adviser of EDSSJ.